These locks were re-moveable, and re-useable. 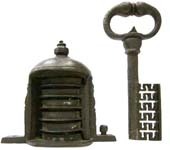 They were used on doors reinforced treasure or "Armada" chests, activating a large number of locking bolts. Some chests had as many as 15-25 locking bolts. The torque required to move these locking bolts often necessitated using a metal rod thru the bow of the key to get enough torque to move the bolts. 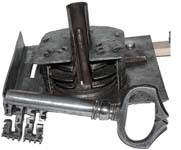 Ward Box and Key. Ward Box: 5" high x 3" wide x 3" deep. Key: 7" long x 3" bow width x 3" bit length x 1 1/2" bit width. Mfg by: German manufacture, 16th-17th c.